Ukrainian troops recorded drastic escalation of the situation in Donetsk sector yesterday. “Russian proxies conducted intense attack with heavy weapons in Avdiivka – Shakhta Butovka frontline from 05:00 till almost 09:00. The enemy used mortars in both locations and tanks near Avdiivka, firing about 80 rounds. Ukrainian troops promptly responded to the escalation returning fire using different weapon systems, including IFVs,” reported Ukrainian Ministry of Defense spokesman on ATO Colonel Andriy Lysenko during a press briefing at Ukraine Crisis Media Center. Two more armed provocations involving light weapons were recorded in Kamianka and Pisky. In total, five hostile provocations took place in Donetsk sector yesterday, two of these involved heavy weapons. In Luhansk sector, militants conducted two mortar attacks in Novotoshkivske and Krymske between 20:00 and 21:00. In Mariupol sector, Russia-backed militant groups attacked in southern seaside area. Militants used various grenade launchers and machine guns in Berezove. The attack continued for over an hour. “Moreover, the enemy conducted four attacks in Vodiane using mortars once. Four light weapons attacks were recorded in Pavlopil and Talakivka, two in each location,” said the spokesman. In total, nine attacks took place in this sector. 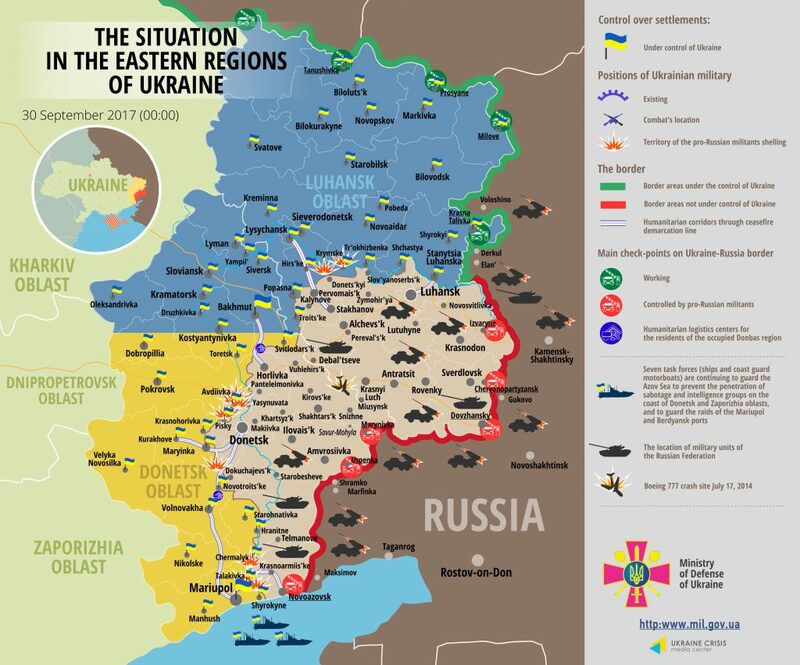 No Ukrainian serviceman was killed in action yesterday, but four troops were wounded. Report on the military developments as of September 29 is available here. Interactive data on the shelling: chronology shelling chart and the interactive map.